Above: Maj. Gen. Glenn K. Rieth, The Adjutant General of New Jersey; Brig. 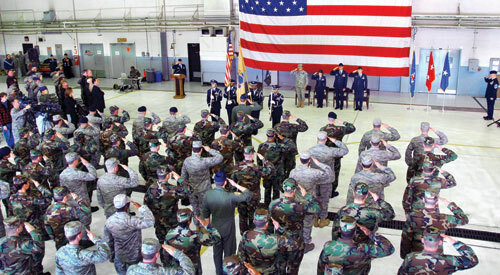 Gen. Maria Falca-Dodson, Commander, New Jersey Air National Guard; Col. Randall S. King, outgoing Commander, 177th Fighter Wing and incoming Commander Col. Robert C. Bolton, along with Airmen of the 177th Fighter Wing salute during the playing of the National Anthem at the Wing's Change of Command Ceremony on Feb. 8. Photo by Master Sgt. Shawn Mildren, 177FW/PA. Photo left: Incoming Commander Col. Robert C. Bolton (r), accepts the 177th’s Colors from Brig. 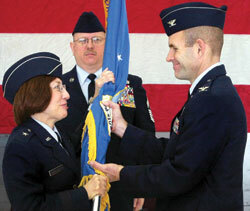 Gen. Maria Falca-Dodson (l), while 177th Command Chief Master Sgt. Michael R. Francis (c) observes during the Change of Command Ceremony held at the Wing. Photo by Tech. Sgt. Mark Olsen, 177FW/PA. Col. Bolton has a Bachelor of Science in Mechanical Engineering from the University of Massachusetts at Amherst in 1983 where he received his commission through the Reserve Officer Training Corps program. After flying F-15s with the 27th Tactical Fighter Squadron at Langley Air Force Base, Va., Bolton joined the 177th where he has served in numerous positions including detachment commander on two counter-drug deployments, operations officer for the F-16 Cmodel conversion and the air-to-ground upgrade program. On September 11, 2001, Bolton stepped in as the unit’s alert operations and scheduling officer, and later served from September 2003 to January 2006 as the alert detachment commander. In February 2006, he deployed to Operation Iraqi Freedom as the assistant operations officer. Bolton, a command pilot, has more than 5,400 flight hours including 1,600 as an instructor pilot.